Double Span-Over Panels are an inexpensive, easy way to get your message out to consumers. 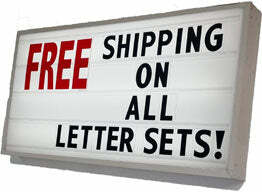 These panels are twice the normal size of your sign letter, grabbing the attention of drivers from greater distances. Whether you use a 4” on 5” letter or an 8” on 10” letter, you can use these specialty graphics panels. Each panel is custom made using durable acrylic. Use over and over again! Don’t see what you want? WE MAKE TO ORDER. 1 to 1000 and more, we'll meet your needs and your deadlines. Call 800-243-6676.